we tend to see a trend of light, easy, on the go products that just make skin look good...and like skin. Urban Decay has expanded their Naked range by adding the Naked Skin - One & Done Hybrid Complexion Perfector. This product comes in unique packaging; both bottle and tube. I'm not sure what the thought behind this tube with a pump is, whether to be more travel friendly or what, but it is packed with 40ml of product to the standard 30ml you would normally get with base products. It's priced at $34 which, when considering the higher volume of product, is not bad at all. What does it do? Well, it says it's a hybrid with both the benefit of a sheer foundation and the coverage of a tinted moisturizer. Basically they've made a sheer foundation with SPF 20 and skincare ingredients in my opinion. It is recommended to be used with a buffing brush and has a demi-matte finish. Urban Decay wanted to create something for when you don't have time for much but you don't want it to look that way. It does have a bit of flashback due to the SPF, though I don't think you'd wear this for a photography event anyway. The type of pigments that UD has used in this are spherical in shape which is what gives a softer focus and allows light to react more naturally, catching the light like skin would since skin is not flat. These types of pigments are often in HD makeup for that reason. I think that this product is a great choice for days out and about, if you are a low coverage gal and just want a little something or if you don't want such a heavy feel as the temperature rises. One & Done feels light on the skin and doesn't have a tacky feel. You can still see freckles through it, so it is sheer coverage and doesn't really build up much (though it doesn't cake when you do another layer). The formula comes in 6 shades that work on a wide range of skin tones. I got the shade Light. The reason the shades work on more skin tones while only having six shades is due to the sheer nature of the product. Yay UD for offering shades equally. Here is a close up of my skin so that you can see in HD what it looks like. My freckles are still there, my skin just has a little something extra that gives it a polished look. Over all I am a fan of this product and it will have a front seat in my summer makeup bag. Between the SPF, peptides, added vitamins and the firming ingredient Gatuline, this product has summer written all over it. Urban Decay also recently launched Beached Bronzer. This sheer, finely milled powdered bronzer comes in two shades Sun Kissed and Bronzed. I opted for Sun Kissed as I am fair and I just want my face to be a little warmed up. These bronzers are matte and yet don't feel dry or heavy. I have found mine to blend with amazing ease and just give a bit of color to my face. I am not a huge fan of bronzers, usually because the colors are too orange or muddy toned on my skin. This one is perfect. My dad even said my skin looked really healthy and fresh when I used it. The packaging says "great for contouring"...I disagree with that. I contour first and then go over with a bigger, fluffy brush in the places I would naturally catch the sun. (Just think of wear you would tan/burn.) I am not a big fan of warm contours and because this is a sheer powder, so that you don't get a streaky finish, it doesn't do enough for me to be a contour. The packaging is supposed to take you to a vacation state of mind...without the aging sun of course. Over all I am a big fan of how this looks and feels on the skin. I don't think I've ever felt a bronzer worked so well for that all over the face, sun kissed look. 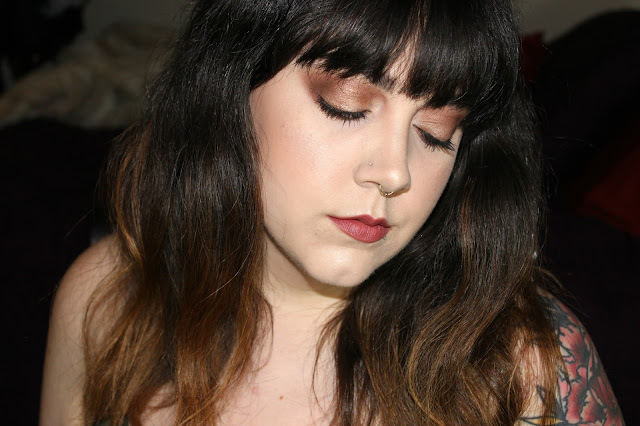 I love the combo between the too products and even used the Urban Decay After Glow Blush in Bittersweet (reviewed here) to add more dimension. collection? Tell me in the comments and feel free to ask any questions you have that I may not have touched on. PS. If you notice my background and lighter are different it's because I'm moving and have started the packing process so please bear with my kitchen as a background for now.